Criminal Minds has always seemed the quiet goth sibling in the procedural family. It’s not as flashy as NCIS, as omnipresent as CSI or as shamelessly fun as Bones. It’s about what lurks at the dark and twisted end of the criminal spectrum. Every week the team look at the scariest, creepiest and most troubling crimes taking place across America. The remit of the FBI team which allows them to travel the country gives a good excuse for why they’re always dealing with big cases, rather than having to come up with increasingly more improbable reasons for why their chosen city is the crime centre of the USA. The changing locations are a wonderful feature of the show, one week they’re in a tiny village in Alaska, the next in LA – the writers use this to full advantage giving fascinating insights into how criminals, victims and law enforcement are different, yet also very much the same. The team has weathered in nicely. It took me a long time to like Rossi, he was gruff and standoffish for a while, which didn’t sit well with him joining MY team. But he has gradually worked his way in and his previous attitude now perfect sense that he would be defensive and troubled at taking a while to get back to being a member of a team and not being in charge, not to mention catching up on knowledge and experience. Likewise Prentiss took a while to grow on me, but now she has a really nice relationship with everyone, relaxing and being goofy and geeky occasionally. I particularly love that there are three strong female characters on this show, each not afraid to be female and have children, pink fluffy hair clips and cravings for shopping, while still being competent and occasionally scary FBI agents. Hotch and Morgan’s relationship was also interesting this year, with the former taking some time away from leading the team and bequeathing its care to Morgan. Both subtly changed in their new roles, Hotch being a little more laid back and seeming to enjoy watching someone else deal with his day to day problems, while still being a kind mentor. Morgan took the power well, not without occasional mistakes – befitting someone taking the next step in their career – but never being afraid to admit his failings and ask for advice. The plot arc of the serial killer targeting Hotch and his family didn’t work well for me, as I frequently find with the cases that get personal for the team. I much prefer them to be subtly effected by things, rather than completely emotionally traumatised. The other problem is that the scale of the fallout rarely seems to be dealt with, the second half of the season hardly referenced the life changing trauma Hotch went through. The standalone episodes continue to be creative, interesting and terrifying. The range they cover is wide, from relatively small, but intense kidnappings, to the mass murderers. Many are pretty disposable, but there’s some great guest casting and interesting locations which make things tick along nicely. Small character moments and humour are scattered throughout giving a great balance each episode of psychology, humour, action, mystery and character. 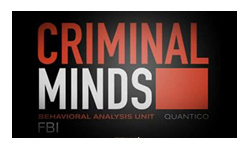 All in all this season of Criminal Minds has been pretty satisfying, while I suppose the big Hotch storyline should have formed the centre, to me what the season was about was the team acting as a team – not one that’s just forming, or even one that’s settling in, but as a team that is now completely comfortable with their roles and each other. Edited to add – the same day I praise the show for finally settling into a great team dynamic and for how strong the female characters are, Michael Ausiello reports that A.J. Cook (JJ) has been told her services are no longer required, and Paget Brewster (Prentiss) will not be appearing in every episode. Apparently it’s for budgetary reasons, but I’m pretty unimpressed and disappointed in these changes. If it’s saving money to fund the (dreadful looking) spinoff, I’m going to be cross.